The SFPD is searching for the woman depicted in this image with a violin that a MUNI passenger left on the bus. 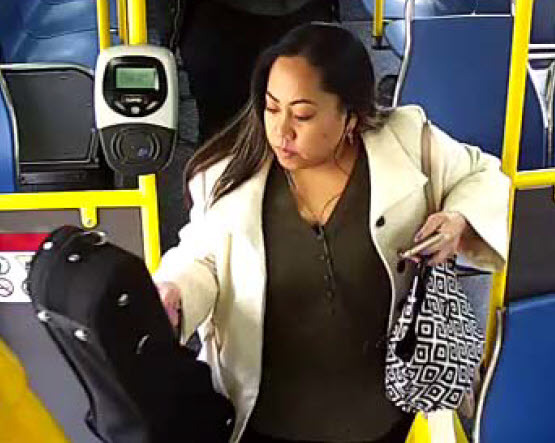 SAN FRANCISCO—The San Francisco Police Department is asking for the public’s help to locate a violin that was stolen on a MUNI bus on February 20. The SFPD reported that at approximately 9:08 a.m. the victim boarded the outbound 38 MUNI bus through the rear doors at Geary and 6th Avenue. The victim sat near the rear side of the bus and placed the violin case under his seat. At approximately 9:14 a.m., a female boarded the outbound bus at Geary and 20th Avenue. She sat at the rear side of the bus. At approximately 9:19 a.m. the victim exited the bus without his violin case at Geary and 33rd Avenue. At approximately 9:21 a.m., the female subject picked up the violin case and exited the bus at Point Lobos/Geary Blvd and 42nd Avenue. The violin is valued at approximately $1,200 and was last seen in the black case. The violin has not been turned in to the San Francisco Police Department or the MUNI Lost and Found, and authorities are attempting to identify the subject pictured in the photos released to the public. Anyone who knows the suspect or has information on the incident is asked to call the SFPD 24 hour tip line at (415) 575-4444 or Text a Tip at TIP411 and begin the text message with SFPD, or email SFPDrichmondstation@sfgov.org. Tipsters may remain anonymous.